1/2 x 1/4-inch Sterling Silver Cross Medal. 3/4 x 1/2-inch Sterling Silver St. Peregrine Laziosi Medal. 3/4 x 1/2-inch Sterling Silver St. John of God Medal. 3/4 x 1/2-inch Sterling Silver St. Lidwina of Schiedam Medal. Our 10" Cherry Crucifix features our money-back guarantee. Our St. Michael Keyring features our money-back guarantee. 1/2" Sterling Silver Blue Enameled Miraculous Medal Made in the USA. The Oval Shape Fancy Border is Adorned with finely detailed Blessed Mother Mary with rays coming out of her extended hands. The Reverse Side of the Medal Portrays an "M" with a Cross on the top and the "Sacred Hearts" underneath surrounded by Twelve Stars. A 13" Rhodium Plated Chain is included with a Deluxe Velour Gift Box. This Sterling Silver Blue Enamaled Miraculous Medal is made in the USA. 4 1/2" St. Jude Fine Pewter Statue, Commissioned to the Absolute Paragon of Detail and Quality, on a Majestic Gold Tone Base. Made in the USA by skilled New England Craftsmen. (Gift Boxed). This 4" Pewter Statue St. Jude Gift Boxed features the CatholicShop.com money-back guarantee. 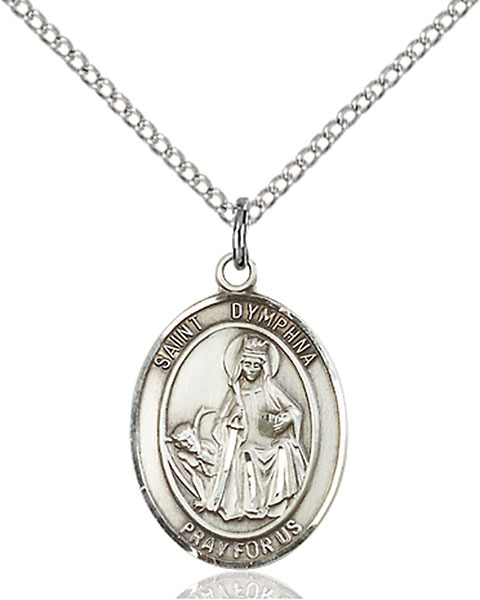 This Sterling Silver St. Dymphna Pendant has passed our quality control assessment and meets our strict criteria to be a Catholic Shop product. Buy with confidence. Catholic Shop aims to carry the finest products on the market. 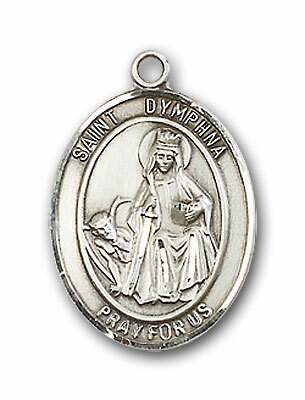 Our staff has inspected and tested this Sterling Silver St. Dymphna Pendant and found it to be worthy of our Satisfaction Guarantee.